Rifle is a mis-matched, beater/ partial-bubba, 1970 arsenal /6616\ . Also: I had never noticed threaded hole on the bottom of the receiver until today. Maybe an indication of a replacement barrel? [Of note, this is the straightest shooter of the 25+ SKS variants that I own or have owned or shot]. Possibly by 1970 the Chinese had perfected the barrel-receiver alignment to increments of 1° out 360? Definitely an odd hen. I've seen them short lugged with cross drilled pin holes, but never threaded. Maybe a set screw to hold the barrel in place because it's not a 0-35 style barrel to receiver interface? If they had to loosen up the fits to get this to work I could see them needing a secondary locking feature. I'm thinking the threaded hole could have been by performed by the same bubba who added the cheese grater and got a tad over zealous with the sandpaper when he re-finished the stock. ...and then, because of how accurate it is, attach an Accumounts PU made for the sks. Do you think the "67" is the degrees of index, then? Could the hole have been for some kind of AK mag adapter kit? Neither of my Ak mag equipped SKSs, a Type 84/SKSNR use that hole in that particular location. I can't speak for what some dingbat does in the basement. And while apples to oranges..threaded vs. press and pin, I have a press fit barrel with a similar, slightly smaller diameter hole in the same exact location. 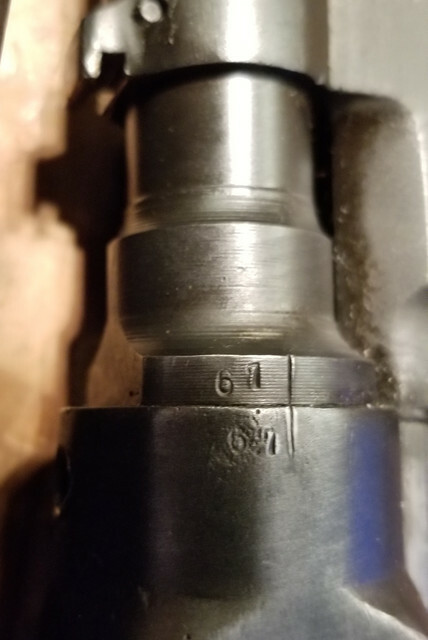 Given a threaded barrel would have to be indexed....and a press fit doesn't have index marks, 2 different style receiver/barrel combos, same weird hole, so maybe there is another reason for the hole. Just to stir thinking, maybe some conversation ........several early years of Mosin production had what is called, grease holes drilled in the bottom of the receiver.. They were eliminated from production, possibly due to better, later methods of barrel removal. At the Philly show last weekend I saw a Chinese sks with an AK mag modification. It had a bakelite spacer screwed into the bottom the receiver. It came with 4 or 5 banana magazines made of the same bakelite ...as if they were a kit. Anyone ever come across and mag adapter set up like this? The rifle also had a lot of the the hallmarks of an IC gun-- i.e. arsenal and serial range, blued bolt, no stock serial, dark red finish, I spent a few minutes examining it, but the seller would not allow me to take any photos. I actually have the adapter that is likely threaded for...it uses a special magazine made of zytel, and is very similar to what you would get with a Marcus mag adapter, but used these special mags, and required brutalizing your gun to attach it. I recall in recent years seeing the mags available somewhere...and they pop up on eBay occasionally...but if I can find it, and you can find a mag it's all yours. Thanks a lot for the offer. I'm not interested in adapting it for ak mags, though. However, if you find the adapter, would you post some photos of it? I'm curious to see if it's the same one I saw at the show last weekend. I'm pretty sure I've seen one like it over the years. Tried to find photos of one like it on line but gave up after 45 minutes of googling. Compared with the photo receiver hole that GM posted above, the hole on my carbine is really rough, and bare, un blued metal...which would seem to suggest that bubba did it. I'm ok with that. As long as it's not missing some kind of locking screw that keeps the barrel seated, I think I can proceed with the Accumounts PU conversion. Anyone else have a /6616\ (or is it 6166?) with similar large numbered pair? Heck man, I don't even have any other catalogued 70 prefixed /6616\s. I have a single 71 prefix and multiple year 22's. Finding one randomly on the net with a good photo of the bottom of the receiver is out I think. Maybe your request will turn something up though, stranger things have happened. Good luck! Maybe it means 06 to 07? Meh, either way, it shoots super duper straight. And with the various bubbafications, I'm looking forward to setting it in the laminate soviet stock and then getting the PU scope mounted. Fun little project to hopefully keep me away from gonebroker for a few seconds. It will be interesting to see if similar indexing numbers show up on other carbines from various arsenals.